Seared grouper cheeks with grilled creamed corn, blistered shishito peppers, torn cilantro, and crispy tomato petals. A while ago, I had the amazing opportunity to be the guest of Urban Tide restaurant at Hyatt Regency Orlando. You can read all about my experience at Urban Tide and see lots of photos of what we ate. 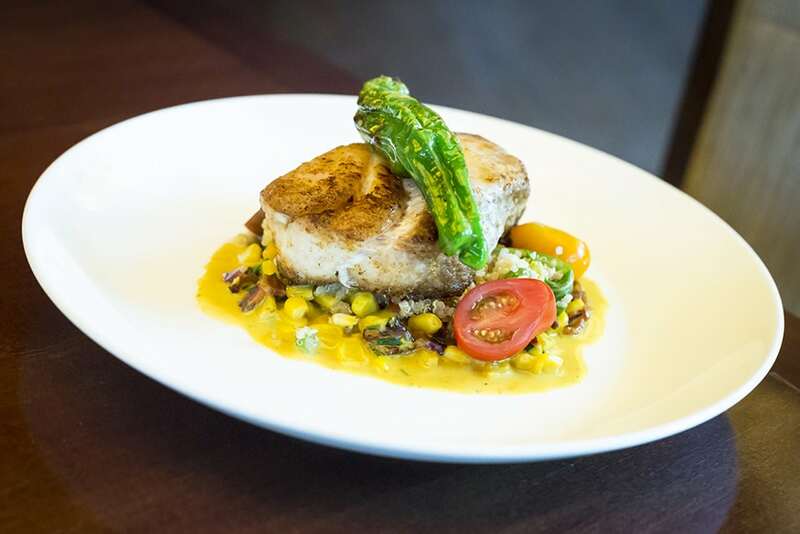 Urban Tide specializes in seafood, and Chef Jared Gross gave me this grouper cheeks recipe to share with you so that you can try it for yourself at home. This is one of the restaurant’s signature appetizers and is prominently featured on the main menu. Seared grouper cheeks with grilled creamed corn, blistered shishito peppers, torn cilantro, and crispy tomato petals. 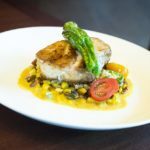 Recipe from Urban Tide restaurant at the Hyatt Regency in Orlando, FL. Heat Oil in a saute pan, Season Cheeks with Salt and Pepper and add to the hot pan and cook for 2 minutes or until golden brown and flip, add butter to pan and baste the cheeks with the butter for another 2 to 3 minutes, add 2 each whole Shishito Peppers to the pan and blister for 1 minute and remove cheeks and peppers from pan and reserve. Remove the oil and butter and use the same pan from the cheeks. Add the onions and cook for 2 minutes or until soft, add both yellow and white corn and deglaze the pan with white wine. Pour in the heavy cream and turmeric and reduce by half. Season with salt and pepper and fold in chives. Remove the core and make an X on the bottom opposite of the core and place in a pot of simmering water for 30 seconds. Remove and immediately place in the bowl of ice water. Once cold peel the skin off the tomato in large pieces. Heat oil to 375 and fry the tomato skins till crispy, remove and place on a paper towel to drain, then season with salt. Spoon the some of the creamed corn mixture onto a plate or in a shallow bowl, stack 2 grouper cheeks on top, place 2 blistered peppers crossed on left side, 3 pieces of crispy tomato skin and tear fresh cilantro leaves over the top. I always see these at the fish counter, but I never knew of the best way to cook grouper cheeks! Awesome and looks fantastic! I didn’t know either, until I learned this method from Urban Tide. Pretty cool! That looks so healthy and delicious. I’m always looking for way to cook fish and with grouper being a family favorite, this one is a keeper. Yay for a new way to enjoy fish, which I adore! I’ll have to keep an eye out for grouper cheeks. What are they like versus regular grouper? Similar in flavor, but with a lovely medallion-like shape. How interesting! I love seafood and this looks fabulous! Thanks for sharing! It is the actual cheek area of the fish, and it is a nice piece of round, all-white meat.